A protester stands with his hands in the air as police officers dressed in riot gear watch as demonstrators protest the day after the not guilty verdict in the murder trial of Jason Stockley, a former St. Louis police officer, charged with the 2011 shooting of Anthony Lamar Smith, who was black, in St. Louis, Missouri, U.S., September 16, 2017. ST. LOUIS - More than 80 people were arrested on Sunday night as protests in St Louis over the acquittal of a white policeman who had shot a black man turned violent for a third night running. Police in riot gear used pepper spray and arrested the demonstrators who had defied orders to disperse following a larger, peaceful protest. After nightfall, a small group remained and the scene turned to one of disorder, following the pattern of Friday and Saturday. Protesters smashed windows and attempted to block a ramp to an interstate highway, police and witnesses said. Officers tackled some protesters who defied police orders and used pepper spray before starting the mass arrests. The protests in St Louis followed the acquittal on Friday of former police officer Jason Stockley, 36, of first-degree murder in the 2011 shooting death of Anthony Lamar Smith, 24. The violence evoked memories of the riots following the 2014 shooting of a black teenager by a white officer in nearby Ferguson, Missouri. Police reported confiscating weapons including handguns and recovered plastic spray bottles containing an unknown chemical that hit officers, who were then decontaminated. 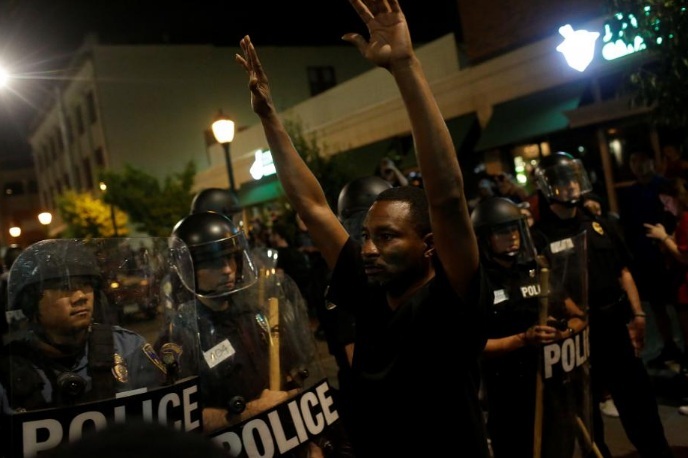 “This is no longer a peaceful protest,” St. Louis police said on Twitter earlier. Protesters broke large ceramic flowerpots and threw chunks of the ceramic at storefront windows. Sunday’s gathering was the largest of the three nights with more 1,000 protesters. Police in turn deployed their largest show of force, as officers in riot gear marched through the streets. “Do they think this will make us feel safe?” said Keisha Lee of Ferguson, shaking her head. Police ordered a group of news photographers to stand up against a wall. One, Kenny Bahr, was working on assignment for Reuters and posted the incident live on Facebook until he was placed in handcuffs when he turned off his video. The photographers were released after about 30 minutes. Earlier in the evening a handful of demonstrators threw bottles in response to a police officer making arrests. As people converged on an unmarked police car holding one suspect, an officer drove through the crowd in reverse to escape, police said. No injuries were reported. The protests began on Friday shortly after the acquittal on Friday, when 33 people were arrested and 10 officers injured. Violence flared anew on Saturday night when about 100 protesters, some holding bats or hammers, shattered windows and skirmished with police in riot gear, resulting in at least nine arrests. Sunday’s arrests again followed earlier peaceful, and far larger, protests. More serious clashes broke out in 2014 in Ferguson, a suburb of St. Louis, following the killing of 18-year-old Michael Brown by a white police officer who was not indicted. The Ferguson protests gave rise to Black Lives Matter, a movement that has staged protests across the United States. An informal group known as the Ferguson frontline has organized the protests, focusing on what it describes as institutional racism that has allowed police to be cleared of criminal wrongdoing in several shootings of unarmed black men. “Windows can be replaced. Lives can‘t,” said Missy Gunn, a member of Ferguson frontline and mother of three including a college-age son. She said she feared for him every night. Smith was shot in his car after Stockley and his partner chased him following what authorities said was a drug deal. Prosecutors argued that Stockley planted a weapon in Smith’s car, but the judge believed the gun belonged to Smith. More than 80 people were arrested on Sunday night as protests in St Louis over the acquittal of a white policeman who had shot a black man turned violent for a third night running. Police in riot gear used pepper spray and arrested the demonstrators who had defied orders to disperse following a larger, peaceful protest.